In 1840 the North Midland Railway came to Chesterfield, opening the north to south route as part of the Sheffield Midland to London St Pancras line. This line crossed the Nottingham Road by the fork with Derby Road at what was to become the Horns Bridge area. This was followed in 1892 by the Chesterfield Loop, basically as part of Manchester to Marlebone line, during which period the Great Central station was built. Finally, in 1897, came LD&ECR’s main line which ran above the existing lines on an impressive viaduct over 60 feet high with seven arches and four girder spans – an impressive feat of engineering. 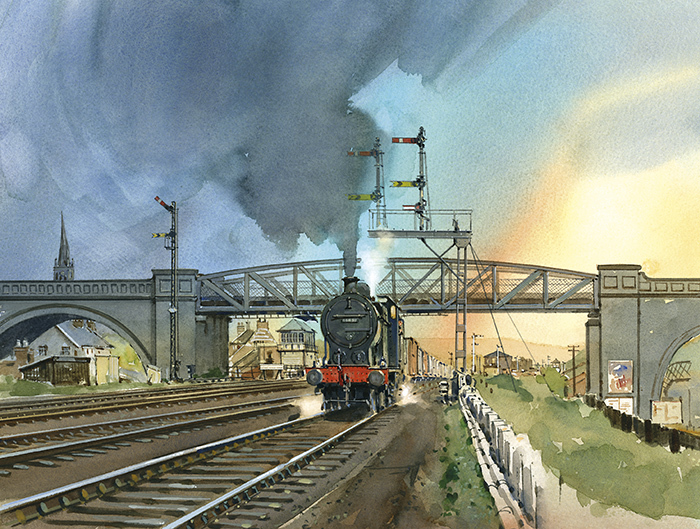 Thus Horns Bridge as we now know it was formed, becoming one of a few places where three main railway lines met in one place – and becoming one of the most famous landmarks in Chesterfield. Website by Peter Maycock and Les Elson.